Serpentine Drive along the Ridge Route. Real photo postcard. Same underlying photograph as this RPPC from a different issuer or series. Ever since the days of Phineas Banning, General Beale and the Butterfield Overland stage, vehicles made their way out of Los Angeles, through San Francisquito Canyon, down the Grapevine Pass, and then into Bakersfield. 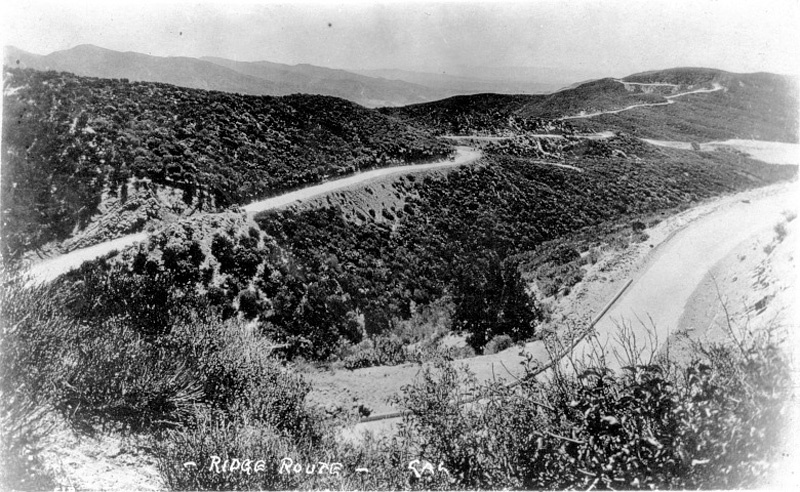 The California Highway Commission was formed in 1911, and one of its first priorities was to build a simpler, more direct road through the La Liebre Mountains. That task fell to the man with the unlikely name of W. Lewis Clark. Frustrated in several attempts to locate an easy way across the stony barrier, Clark, at last, blazed a trail right over the top from the mouth of Castaic Canyon to Gorman. It was called the Ridge Route. In 1933 Highway 99 was carved up the canyons, bypassing the 18-year-old Ridge Route, which was already antiquated. HS9017: 4800 dpi jpeg from original RPPC acquired by SCV Historical Society in 2003.